Cats are independent creatures at heart, but since they have been domesticated it is not uncommon for felines to have separation anxiety. It can cause unwanted behaviors like: clawing, peeing, or destruction of furniture; so it is best to try and help your cat with their anxiety to keep them happy and healthy. If your cat refuses to let you leave by either talking to you, clinging to you, or disappearing, then your cat might have separation anxiety. While you’re gone, if your cat pees or poops outside the cat box, vomits, refuses to eat, yowls constantly, grooms excessively, or claws the furniture; separation anxiety is most likely the cause. Some symptoms of separation anxiety are a bit of a shock to cat owners, and some cats only feel separation anxiety when their owner is away for more than two or three days. If your cat is mainly anxious when you are away from the house for long periods, then there are more precise methods of reducing anxiety. Separation anxiety can vary in cats, so not all methods might work for your cat’s type of anxiety. Talking to your vet can help you to determine what the best method of anxiety reduction is for your cat. These are a few tips to help relieve daily separation anxiety in your feline. You might be saddened to leave on a trip without saying a final farewell to your cat, but saying a long goodbye can trigger your cat’s anxiety. Cat’s don’t normally like it when things change up, so your strangely long goodbye might clue them in to the fact that something is about to be different and cause them to get anxious. Leaving as quickly and normally as possibly will be best with an anxious kitty. When you get home, don’t make a big fuss about returning to your kitty. If your cat starts any unwanted behaviors when you return, do not give them your attention or they will feel rewarded and continue the behavior. Only address your kitty when you are both calm and no unwanted behaviors are in progress. Some cats get separation anxiety when they are bored from lack of mental or physical stimulation. Sprinkle feeder puzzles and other toys around your house to help with this. The toys and puzzles will also distract them instead of having them focus on how you aren’t there. Pheromones can have a calming effect on cats, but a more common relaxant is catnip. If your cat doesn’t react to catnip, there are other plants that are similar that your cat might find tempting. Catnip toys are the best of both worlds, a distraction and something to help your cat relax. Before you try this, be sure to see how your cat reacts to the toy, catnip can make some cats even more energetic. 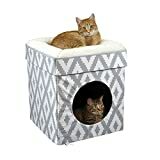 For most kitties, boxes and cat trees can reduce stress and aid recovery. Boxes are secluded places where your cat will feel safe since they cannot be attacked. 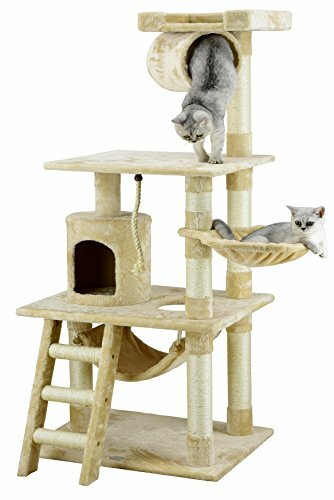 High perches (like a shelf in a book case) or cat trees can make your cat feel safe because they can view their entire kingdom and see there are no predators coming to get them. Also, climbing up and down a cat tree or jumping on top of a box can help a cat burn of the anxious energy they are feeling. The final step, if nothing else works, is to go talk to your vet about finding a medication that might help your cat. Some anxiety medication should only be given to your cat when they really need it, others are a daily pill you can give your feline friend that will help them over time. You should talk to your veterinarian about the side effects of the medicine and look them up online. Always follow the instructions closely. Another option is to get a companion for your cat so they have someone to be with while you are gone. However, don’t just throw your cat in the deep end; see how they react around other animals before deciding this is the option for you. Invite a friend to come over with their dog/cat to see how your cat reacts to another animal in its territory. If all goes well, temporarily foster a cat or dog and see if your current feline bonds with the animal, then decide whether this option is the best one for your household. It will help your cat’s anxiety, give another animal a place to live, and double the amount of daily cuddles you receive. ← Does Your Cat Like Music?